Cardholders willing to put in the effort will find this to be one of the best travel credit cards available. 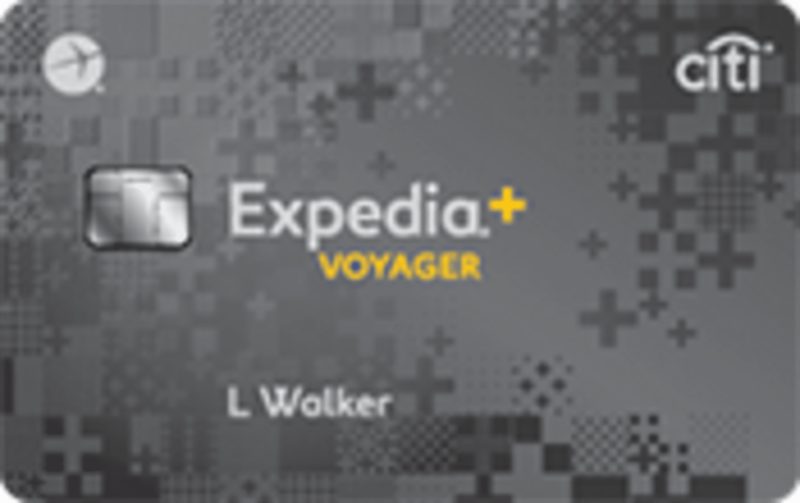 The Expedia®+ Voyager Card from Citi is one of the most rewarding credit cards we've seen. However, for most consumers, the card's value is buried in a complex rewards program that requires heavy user involvement. So, if you're someone who enjoys maximizing your rewards, then this is one of the better cards available. However, if you're not, other cards may better suit your needs, which we discuss below. How Does the Expedia®+ Voyager Card from Citi Compare? Review: Is the Expedia®+ Voyager Card from Citi Worth It? The Expedia®+ Voyager Card from Citi has the potential to be one of the best travel credit cards in the hands of the right user. That's because the card allows cardholders to earn a high number of points on Expedia purchases and a decent number of points on restaurant and entertainment expenses. The value you'll get out of each point will vary, but we estimate each point to be worth approximately $0.007. The points you earn with the Expedia®+ Voyager Card from Citi are in addition to the base points you can earn as an Expedia rewards member. That means eligible Expedia purchases made with the Expedia®+ Voyager Card from Citi will result in a 4.2% rewards rate. Leading travel credit cards rarely award above a 2.5% rewards rate, making the Expedia®+ Voyager Card from Citi an excellent choice for people who spend a lot of money on Expedia purchases. When the card is used for other purchases, however, the rewards rate plummets because you won't be earning the base points. For instance, spending on dining and entertainment yields a low 1.4% rewards rate, and all other spending earns a meager 0.7% rewards rate. Therefore, if you're not booking travel through Expedia at least once per year, we recommend applying for a different credit card. While the card comes with a $95 annual fee, it has a few features that help offset that cost. For instance, it awards a $100 annual air travel fee credit, which can be used for airline incidentals and either Global Entry or TSA Precheck. Additionally, the card offers automatic gold status for each year of card membership. Bottom Line: The Expedia®+ Voyager Card from Citi is well worth applying for if you frequently make Expedia purchases. If you don't, then we would recommend applying for a separate card that offers a high rewards rate outside of Expedia purchases. As mentioned, this card can earn you a ton of Expedia points. For instance, let's assume you wanted to purchase a $2,000 flight and hotel package on Expedia.com. Below, we'll lay out how many points you'd earn with this card, with the Expedia®+ Card from Citi, and without either of the two cards. The points you earn with the Expedia®+ Voyager Card from Citi can be redeemed for a lot of different rewards, including hotel nights, rental vehicles, and discounts on experiences such as attractions and tours. Your points will go further when you use them to book one of Expedia's 4,000+ VIP access hotels. That's because points are worth double when you book one of these hotels, and +gold members also get 250 bonus points when booking them. How Does the Expedia®+ Voyager Card from Citi Compare to Other Cards? In order to get a sense of the value offered by the Expedia®+ Voyager Card from Citi, it's important to compare it against other available options. We outline how the card stacks up against other cards, below. Between these two cards, the Expedia®+ Voyager Card from Citi will be the better choice for most. That's because it offers a greater amount of categories where cardholders can earn more points and a higher sign-up bonus. While the Expedia®+ Card from Citi can be a decent option, everything it does well is done better by the Expedia®+ Voyager Card from Citi. The annual fee on the Expedia®+ Voyager Card from Citi can be off-putting to some, but the card offers enough benefits to make up for that annual fee, like a $100 annual air travel fee credit. Provided you use the travel fee credit every year, you'll be coming out ahead. You'd prefer a card without an annual fee. The Chase Sapphire Preferred® Card is an excellent card for earning travel rewards since it's part of Chase Ultimate Rewards—one of the best credit card rewards programs. If you're looking for versatility in the rewards you earn from a credit card, the Chase Sapphire Preferred® Card has the Expedia®+ Voyager Card from Citi beat. That's because the Chase Sapphire Preferred® Card earns cardholders an excellent 2.5% rewards rate on travel and dining purchases (2 points per dollar multiplied by the 1.25 bonus when redeeming for travel on the Chase portal). As an added plus, the card's welcome bonus is one of the best around and is currently worth $750 in travel rewards. Just keep in mind that in the long term, the Expedia®+ Voyager Card from Citi becomes a much more attractive card due to the anniversary bonus points. You're interested in booking travel directly or outside of Expedia.com.